B/Z Rights & Permissions, Inc. The B/Z Rights Stuff, Inc. 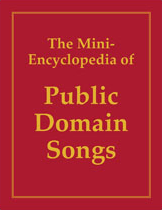 The Mini-Encyclopedia of Public Domain Songs is a listing of over 800 popular songs, all of them classics, which are now in the Public Domain in the United States. The book's emphasis is on popular music and includes selections by Berlin, Kern, Gershwin, and many other well known composers. Listings are by title and category. Categories include Popular Music, Christmas Music, Classical Selections, Children's Songs, Folk Songs, International Favorites, Songs for Special Occasions, Marches and a whole lot more -- much more. The book contains death dates for composers, enabling users to determine the copyright status of the compositions throughout the world. The Mini-Encyclopedia is a handy terrific resource. The 1998 Copyright Term Extension Act extended the term of all works copyrighted in the United States for 20 years. Nothing new will go into the Public Domain for 20 years. The 20 year period began January 1, 1999, and will end (if no further laws are passed) December 31, 2018. Since there can be no new editions of The Mini-Encyuclopedia, B/Z Rights Stuff is now making it available at a much lower price and as a study HARDBACK book in large clear type. Earlier annual ring bound editions sold for $300 and more.